Tankless water heaters can lead to big savings. However, there are pros and cons to installing a tankless water heater. In order to help you weigh the pros and cons, here are the most important things you need to know before you buy and install your tankless water heater. For a typical tank water heater, on average you would pay between $300 and $800. For a tankless water heater, the initial costs to install it can range anywhere from $1,000 to $3,000. That doesn’t even include the accessories required for installation. From valves, adaptors and tubes to rewiring the electricity in your home, installing a tankless water heater can cost up to $5,000 altogether. These costs can pile up quickly, so make sure that you have accurately assessed your needs and the associated costs before you go ahead and take the plunge. So why would you pay $5,000 for something that you could buy for less than $1,000? For one thing, according to the U.S. Department of Energy, you will save around $64 more per year on your electric bill by switching to a gas or electric tankless water heater. Both of these are more energy efficient than a storage tank water heater. On top of that, tankless water heaters last longer. These water heaters have a longer than 20-year lifespan, as opposed to storage tank heaters, which last only around 10 years. And tankless water heaters take up much less space than do traditional tank water heaters. If you plan to self-install your tankless water heater, make sure you read the owner’s manual thoroughly. Be careful installing the chimneypieces, gas line or electric wiring, and water line so you that it gets installed safely. Though significantly smaller in size, tankless water heaters possess three times the heating capacity, creating three times the “boom” if installed incorrectly. It is highly recommended that unless you are a licensed plumber, you let a professional installer or plumber install your tankless water heater. Determine your hot water needs. Understand the needs of large appliances like the dishwasher and washing machine. 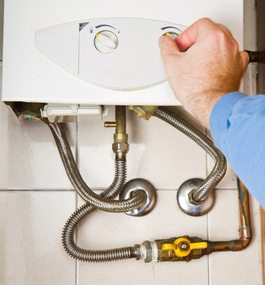 Carefully plan the location of your water heater. Check your gas and water supplies. Know your local building codes. Make sure venting material complies with the manufacturer’s specifications.